For other uses, see Ammon (disambiguation). Ammon (Hebrew: עַמּוֹן, Modern: Ammon, Tiberian: ʻAmmôn; Arabic: عمّون‎, translit. ʻAmmūn) was an ancient Semitic-speaking nation occupying the east of the Jordan River, between the torrent valleys of Arnon and Jabbok, in present-day Jordan. The chief city of the country was Rabbah or Rabbath Ammon, site of the modern city of Amman, Jordan's capital. Milcom and Molech (who may be one and the same) are named in the Hebrew Bible as the gods of Ammon. The people of this kingdom are called "Children of Ammon" or "Ammonites". The Ammonites occupied the northern Central Trans-Jordanian Plateau from the latter part of the second millennium BC to at least the second century CE. Ammon maintained its independence from the Neo-Assyrian Empire through tribute to the Assyrian king, at a time when nearby kingdoms were being raided or conquered. The Kurkh Monolith lists the Ammonite king Baasha ben Ruhubi's army as fighting alongside Ahab of Israel and Syrian allies against Shalmaneser III at the Battle of Qarqar in 853 BC, possibly as vassals of Hadadezer, the Aramaean king of Damascus. In 734 BC the Ammonite king Sanipu was a vassal of Tiglath-Pileser III, and Sanipu's successor Pudu-ilu held the same position under Sennacherib and Esarhaddon. An Assyrian tribute-list exists from this period, showing that Ammon paid one-fifth as much tribute as Judah did. Somewhat later, the Ammonite king Amminadab I was among the tributaries who suffered in the course of the great Arabian campaign of Assurbanipal. Other kings attested to in contemporary sources are Barachel (attested to in several contemporary seals) and Hissalel, the latter of whom reigned about 620 BCE. Hissalel is mentioned in an inscription on a bottle found at Tel Siran, Jordan along with his son, King Amminadab II, who reigned around 600 BCE. Archaeology and history indicate that Ammon flourished during the Neo-Babylonian Empire period. This contradicts the view, dominant for decades, that Transjordan was either destroyed by Nebuchadnezzar II, or suffered a rapid decline following Judah's destruction by that king. Newer evidence suggests that Ammon enjoyed continuity from the Neo-Babylonian to the Persian period. Little mention is made of the Ammonites through the Persian and early Hellenistic periods. Their name appears, however, during the time of the Maccabees. The Ammonites, with some of the neighboring tribes, did their utmost to resist and check the revival of the Jewish power under Judas Maccabaeus. The Hasmonean dynast Hyrcanus founded Qasr Al Abd, and was a descendant of the Seleucid Tobiad dynasty of Tobiah, who is mentioned by Nehemiah as an Ammonite (ii. 19) from the east-Jordanian district. The last notice of the Ammonites is in Justin Martyr's Dialogue with Trypho (§ 119), in the second century, where it is affirmed that they were still a numerous people. The first mention of the Ammonites in the Bible is in Genesis 19:37-38. It is stated there that they descended from Ben-Ammi, a son of Lot through with his younger daughter who plotted with her sister to intoxicate Lot and in his inebriated state, have relations to become pregnant. Ben-Ammi literally means "son of my people". After the destruction of Sodom and Gomorrah, the daughters of Lot wanted to have a child and carried out a plot to intoxicate him and had relations, resulting in Ammon and his half brother, Moab, being conceived and born. This narrative has traditionally been considered literal fact, but is now generally interpreted as recording a gross popular irony by which the Israelites expressed their loathing of the morality of the Moabites and Ammonites, although it is doubtful that the Israelites would have directed such irony to Lot himself. The Ammonites settled to the east of the Jordan, invading the Rephaim lands east of Jordan, between the Jabbok and Arnon, dispossessing them and dwelling in their place. Their territory originally comprising all from the Jordan to the wilderness, and from the River Jabbok south to the River Arnon. It was accounted a land of giants; and that giants formerly dwelt in it, whom the Ammonites called Zamzummim. Shortly before the Israelite Exodus, the Amorites west of Jordan, under King Sihon, invaded and occupied a large portion of the territory of Moab and Ammon. The Ammonites were driven from the rich lands near the Jordan and retreated to the mountains and valleys to the east. The invasion of the Amorites created a wedge and separated the two kingdoms of Ammon and Moab. Throughout the Bible, the Ammonites and Israelites are portrayed as mutual antagonists. During the Exodus, the Israelites were prohibited by the Ammonites from passing through their lands. The Ammonites soon allied themselves with Eglon of Moab in attacking Israel. The Ammonites maintained their claim to part of Transjordan, after it was occupied by the Israelites who obtained it from Sihon. During the days of Jephthah, the Ammonites occupied the lands east of the River Jordan and started to invade Israelite lands west of the river. Jephthah became the leader in resisting these incursions. The constant harassment of the Israelite communities east of the Jordan by the Ammonites was the impetus behind the unification of the tribes under Saul. King Nahash of Ammon (c. 1010 – 990 BC) lay siege to Jabesh-Gilead. Eventually this led to an alliance with Saul and The Israelites, led by Saul relieved the siege and defeated the Ammonite king, eventually resulting in the formation of the Israelite Kingdom. 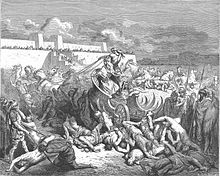 During the reign of King David, the Ammonites humiliated David's messengers, and hired the Aramean armies to attack Israel. This eventually ended in a war and a year-long siege of Rabbah, the capital of Ammon. The war ended with all the Ammonite cities being conquered and plundered, and the inhabitants being killed or put to forced labor at David's command. When the Arameans of Damascus city-state deprived the Kingdom of Israel of their possessions east of the Jordan, the Ammonites became allies of Ben-hadad, and a contingent of 1,000 of them served as allies of Syria in the great battle of the Arameans and Assyrians at Qarqar in 854 BC in the reign of Shalmaneser III. The Ammonites, Moabites and Meunim formed a coalition against Jehoshaphat of Judah. The coalition later was thrown to confusion, with the armies slaughtering one another. They were subdued and paid tribute to Jotham. After submitting to Tiglath-pileser they were generally tributary to Assyria, but have joined in the general uprising that took place under Sennacherib; but they submitted and they became tributary in the reign of Esar-haddon. Their hostility to Judah is shown in their joining the Chaldeans to destroy it (2 Kings 24:2). Their cruelty is denounced by the prophet Amos (Amos 1:13), and their destruction (with their return in the future) by Jeremiah (Jeremiah 49:1-6); Ezekiel (Ezekiel 21:28-32); and Zephaniah (Zephaniah 2:8-11). Their murder of Gedaliah (2 Kings 25:22-26; Jeremiah 40:14) was a dastardly act. They may have regained their old territory when Tiglath-pileser carried off the Israelites East of the Jordan into captivity (2 Kings 15:28; 1 Chronicles 5:26). Tobiah the Ammonite united with Sanballat to oppose Nehemiah (Nehemiah 4:1-14), and their opposition to the Jews did not cease with the establishment of the latter in Judea. They also joined the Syrians in their wars with the Maccabees and were defeated by Judas. According to both 1 Kings 14:21–31 and 2 Chronicles 12:13, Naamah was an Ammonite. She was the only wife of King Solomon to be mentioned by name in the Tanakh as having borne a child. She was the mother of Solomon's successor, Rehoboam. The Ammonites presented a serious problem to the Pharisees because many marriages between Israelite men and Ammonite (and Moabite) women had taken place in the days of Nehemiah. The men had married women of the various nations without conversion, which made the children not Jewish. The legitimacy of David's claim to royalty was disputed on account of his descent from Ruth, the Moabite. The economy, for the most part, was based on agriculture and herding. Most people lived in small villages surrounded by farms and pastures. Like its sister-kingdom of Moab, Ammon was the source of numerous natural resources, including sandstone and limestone. It had a productive agricultural sector and occupied a vital place along the King's Highway, the ancient trade route connecting Egypt with Mesopotamia, Syria, and Asia Minor. As with the Edomites and Moabites, trade along this route gave them considerable revenue. Circa 950 BCE Ammon showed rising prosperity, due to agriculture and trade, and built a series of fortresses. Its capital was located in what is now the Citadel of Amman. To the vineyard and the orchard! Or shall I be left behind and destroyed? And shall I inflame myself with it and be ruined? And bring joy for many days and long years. Wikimedia Commons has media related to Ammon. ^ Marilyn J. Lundberg. "Ancient Texts Relating to the Bible: Amman Citadel". University of Southern California. Archived from the original on 2010-11-26. Retrieved 2011-01-11. ^ LaBianca, Øystein S.; Younker, Randall W. (1995). "The Kingdoms of Ammon, Moab and Edom: The Archaeology of Society in Late Bronze/Iron Age Transjordan (ca. 1400–500 BCE)". In Levy, Tom (ed.). The Archaeology of Society in the Holy Land. A&C Black. p. 399. ISBN 9780718513887. 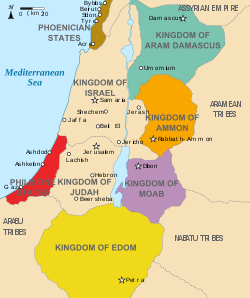 ^ a b "The Old Testament Kingdoms of Jordan". Archived from the original on 6 May 2009. Retrieved 2009-05-12. One or more of the preceding sentences incorporates text from a publication now in the public domain: Chisholm, Hugh, ed. (1911). "Ammonites" . Encyclopædia Britannica. 1 (11th ed.). Cambridge University Press. pp. 863–864. ^ See Schrader, K.A.T. pp. 141 et seq. ; Delitzsch, Paradies, p. 294; Winckler, Geschichte Israels, p. 215. ^ Barstad, Hans M (18 February 2012). "The City State of Jerusalem in the Neo-Babylonian Empire: Evidence from the Surrounding States". In John J. Ahn; Jill Middlemas (eds.). By the Irrigation Canals of Babylon: Approaches to the Study of the Exile. Bloomsbury Publishing. pp. 42–44. ISBN 978-0-567-19775-7. ^ 1 Maccabees 5:6; cf. Josephus Jewish Antiquities xii. 8. 1. ^ St. Justin Martyr. "Dialogue with Trypho". Early Christian Writings. Peter Kirby. Retrieved 27 June 2016. ^ a b c "www.Bibler.org - Dictionary - Ammon". 2012-06-15. ^ Mirabeau, Honoré (1867). Erotika Biblion. Chevalier de Pierrugues. Chez tous les Libraries. ^ "Naama". The Jewish Encyclopedia. Archived from the original on 13 August 2007. Retrieved 2007-08-05. ^ According to Babylonian Talmud, Doeg the Edomite was the source of this dispute. He claimed that since David was descended from someone who was not allowed to marry into the community, his male ancestors were no longer part of the tribe of Judah (which was the tribe the King had to belong to). As a result, he could neither be the king, nor could he marry any Jewish woman (since he descended from a Moabite convert). The Prophet Samuel wrote the Book of Ruth in order to remind the people of the original law that women from Moab and Ammon were allowed to convert and marry into the Jewish people immediately. ^ Cohen, D (ed) (1988). "Les Langues Chamito-semitiques". Les langues dans le monde ancien et modern, part 3. Paris: CNRS. CS1 maint: Extra text: authors list (link) Aufrecht, WE (1989). A Corpus of Ammonite Inscriptions. Lewiston: E. Mellen Press. ISBN 0-88946-089-2. ^ Younker, Randall W. (1999). "Review of Archaeological Research in Ammon". In Burton MacDonald; Randall W. Younker (eds.). Ancient Ammon. BRILL. p. 1–. ISBN 978-90-04-10762-5. ^ "The Tell Siran inscription. Linguistic and historical implications" (PDF). EJ Smit. Potche£stroom University. Retrieved 2015-10-09. This article incorporates text from a publication now in the public domain: Easton, Matthew George (1897). "Ammon" . Easton's Bible Dictionary (New and revised ed.). T. Nelson and Sons. This article incorporates text from a publication now in the public domain: Singer, Isidore; et al., eds. (1901–1906). "Ammon, Ammonites". The Jewish Encyclopedia. New York: Funk & Wagnalls. Hertz J.H. (1936) The Pentateuch and Haftoras. "Deuteronomy." Oxford University Press, London.